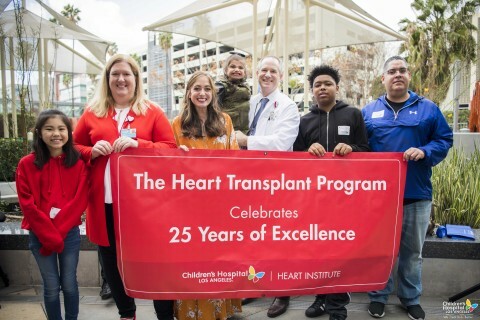 LOS ANGELES--(BUSINESS WIRE)--This month, The Heart Institute at Children’s Hospital Los Angeles (CHLA) celebrates the 25th anniversary of its pediatric heart transplant program, the first dedicated pediatric heart transplant program in a free standing children’s hospital in Southern California. To date, CHLA surgeons have helped provide new hearts to more than 130 children, and counting. "We are very proud to mark a quarter century of giving children with the most complex heart conditions a new start," says Vaughn Starnes, MD, Director of the Heart Institute and founder of the Division of Cardiothoracic Surgery at Children’s Hospital Los Angeles. "It’s extremely rewarding for our dedicated physicians, nurses and staff to be able to make a difference in the lives of these children and enhance their quality of life." The program launched in 1993 under the leadership of Dr. Starnes, who is also a Distinguished Professor and Chair of the Department of Surgery at the Keck School of Medicine of USC. Today, the Heart Institute's heart transplant program is led by medical director JonDavid Menteer, MD, and surgical director Cynthia Herrington, MD. 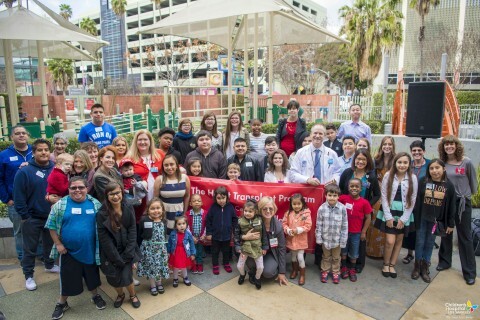 On Monday, February 12, 2018, more than 35 heart transplant patients, spanning two years of age to 37 years old, traveled from as far as San Francisco for an emotional reunion at CHLA with their CHLA medical family – surgeons, cardiologists, nurses and other caregivers – to commemorate this special milestone. Many are now grown and working as speech therapists, nurses and surgical technicians, serving as inspiration to the younger generation of CHLA pediatric heart transplant patients. For nearly a century, CHLA has been an established pioneer in pediatric heart medicine, ever since its doctors performed the first pediatric heart surgery on the West Coast in the 1930's. The hospital also established the first pediatric cardiothoracic care unit on the West Coast. CHLA's Heart Institute comprises an integrated inpatient and outpatient suite of services that combines experts in cardiology, cardiothoracic surgery, cardiothoracic transplant, cardiothoracic intensive care and cardiovascular acute care. CHLA medical experts treat complex heart conditions and congenital defects from patients still in utero all the way to adulthood. CHLA is ranked as one of the top 10 pediatric heart programs in the nation in U.S. News & World Report's prestigious annual Best Children's Hospital survey. The Heart Institute at Children’s Hospital Los Angeles celebrates the 25th anniversary of its pediatric heart transplant program.